In Part I of II in this blog series, discussion included the challenges of screening methyltransferases, steps in developing an SAH assay, the experimental assay procedure, assay sensitivity, and reagent stability. Please view the previous post here: Creating a Methyltransferase HTS Assay Using an SAH Riboswitch Part I. As part of continued assay development, it was necessary to learn more about the how the assay responds under conditions used for HMT enzyme reactions. We first determined whether typical methyltransferase acceptor substrates would interfere with the AptaFluor™ detection reagents. As one example, since histones bind nucleic acids, the RNA aptamer may also bind to them. We were also concerned about nucleosomes, which are required by some histone methyltransferases and are a somewhat crude cell fraction that could easily contain RNases. After initial testing it was determined that the assay could accommodate many commonly used HMT substrates as well as poly-dIdC for DNA methyltransferases. Figure 1. Toleration of MT acceptor substrates. 100 nM SAH-SAM standard curves were set up in the presence of nucleosomes (10 ng/μL), histone H3-3 (3 ng/μL), Histone H3 (1-21) peptide (10 μM) and Poly d (I-C) (2.5 mU/μL); control wells lacked a MT substrate. Early in the assay development process, HMT enzymes were tested for detection. The assay response was very robust regardless of the acceptor substrate. 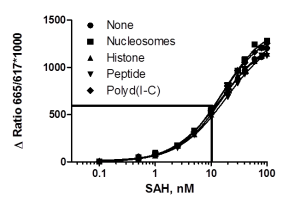 These enzyme titrations illustrate the sensitivity of the assay. A concentration of 200 nM SAM was used for Dot1L and G9a to reflect their reported Km values. This sensitivity would not have been possible with other non-radioactive methyltransferase assay methods. The amount of enzyme required for a robust signal is also lower, which will allow significant cost reductions for large screens. Figure 2. Testing the assay with a variety of methyltransferases. The following is a case study is used to evaluate the assay in greater detail with G9a/GLP complex, a heterodimer of two SET domain methyltransferases that catalyzes mono- and di-methylation at Lys 9 of histone H3. 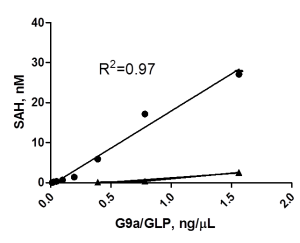 The G9a/GLP complex was titrated in the presence of 10 uM H3 (1-21) peptide and 200 nM SAM. 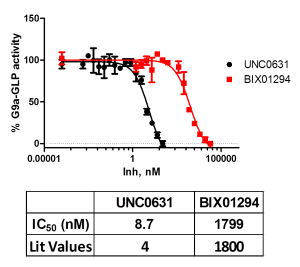 The raw signal response produces a sigmoidal curve, as expected for a binding assay. Using a standard curve, the TR-FRET ratios were converted into SAH detected in the enzymatic reaction. 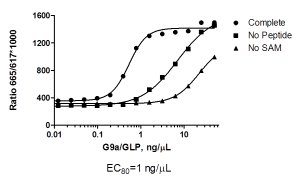 The assay demonstrates a linear response to changes in enzyme concentration. The time courses also show a linear response, indicating that initial velocity is being measured under these conditions. Figure 3. G9a/GLP complex was titrated in the presence of 200 nM SAM and 10 μM H3 (1-21) peptide for 60 minutes at RT to determine an optimal (EC80) concentration of 1 ng/μL. Enzyme reactions were quenched with denaturing detergent. Figure 4. TR-FRET values were converted to SAH production to assess reaction progress. Figure 5. Time courses demonstrate linear SAH production with time, respectively. Initial velocity reactions (10% conversion of SAM to SAH) were used for Z’ analysis. Two types of negative controls were used, one with no acceptor peptide and one lacking SAM. Both approaches yielded Z’ values well over 0.8, reflecting the low standard deviations which were 1.5% for the positive controls and less than 5% for both negative controls. These statistics also reflect the stability of the reagents since any degradation of the RNA aptamer would cause signal variability. Figure 6. A Z` of 0.8 was obtained (n=16) for an initial velocity G9a/GLP reaction (1 ng/μL, 60 min). 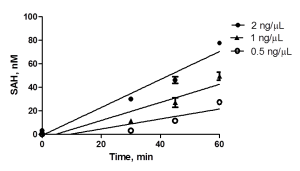 Dose response curves for two G9a specific probes at the optimal EC80 concentration of G9a/GLP were created as a 12 point curve. IC50 values were determined after conversion of ratios to product formed using a standard curve. This demonstrates the assay can be used to determine inhibitory responses and to screen for enzymatic inhibitors. Figure 7. 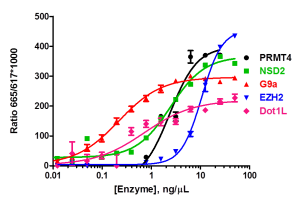 Dose response curves with known inhibitors UNC0631 and BIX01294 showed IC50 values of 8.7nM and 1.8 μM, respectively. The AptaFluor SAH Methyltransferase Assay leverages the exquisite affinity and selectivity of a microbial riboswitch for direct detection of SAH with a TR-FRET signal. The assay is ultra-sensitive with a broad dynamic range. The LLD is 1.25 nM SAH and the assay produces outstanding Z’ values from 10 nM to 1000 nM SAH. Outstanding reagent and signal stability. Reagents and signal are both stable for several hours, providing flexibility for automated HTS environments. The assay is universal accommodating common HMT acceptor substrates and enables detection of diverse HMTs, including Dot1L and EZH2. Please note data from part I & II of this series was presented at DOT 2016 in Boston, MA. BellBrook Labs is in the final stages of bringing this product to market. Some changes in the assay may occur to provide the best results to our customers. This research was funded in part by SBIR grants 2R43GM109621 and 2R44GM109621 from NIGMS.